Beneath the shade of monkeypod trees, the red clapboard downtown strip of Old Koloa Town welcomes visitors to a bygone era, the former site of Koloa Plantation. Founded in 1835 by New England missionaries, Koloa was the largest sugar plantation in a statewide industry credited with encouraging immigrants from around the world to make Hawaii home. Today the strip—accessed through a mile-long tree tunnel of towering eucalyptus—is a tiny community of gift shops, ice cream parlors, galleries and restaurants, each with a building plaque describing its original purpose on the plantation. Besides shopping there’s the Old Koloa Jodo Mission, a still-functioning Buddhist temple originally founded to serve the Japanese immigrant community; a semi-circular bronze sculpture depicting plantation workers; an old stone chimney left over from one of the plantation buildings; and the Koloa History Center set back along the Waikomo Stream running through downtown. The center includes indoor and outdoor historical artifacts including a vintage sewing machine, an antique gas pump, farm equipment, historical photographs and displays. Every summer for nine days, the town celebrates its heritage with parades, food and craft booths, outdoor movies, a paniolo (Hawaiian cowboy) rodeo and guided educational walks. 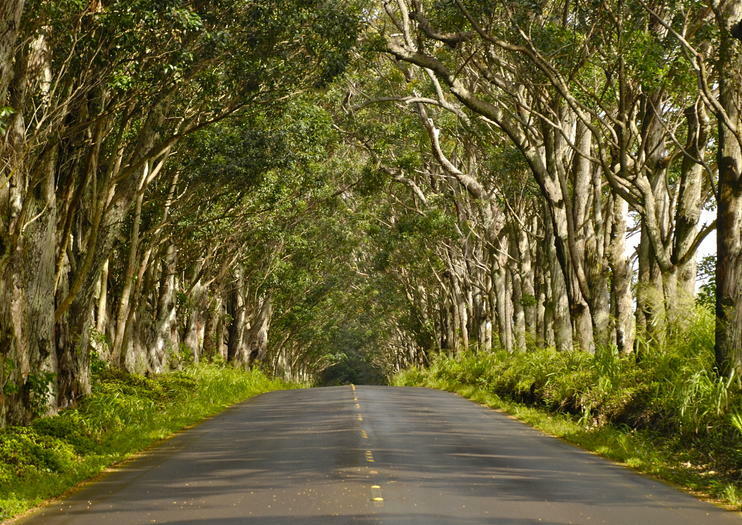 Old Koloa Town is a jaunt north of southerly Poipu Beach, or about a 10-mile drive west from Lihue. Downtown shops and the Old Koloa Town History Center open around 9 a.m. The Koloa Plantation Days event usually runs over the course of a week in mid-July.